The independent TD told Morning Ireland it was the duty of independents to support someone who wants to contest the election. INDEPENDENT TD MICHAEL Fitzmaurice has urged fellow independent Oireachtas members to come together to nominate a candidate to contest the presidency. Speaking on Morning Ireland the TD for Roscommon-Galway said it was the duty of independents elected to the Oireachtas to facilitate someone who wants to run for the presidency. Gemma O’Doherty, Gavin Duffy, Senator Joan Freeman, Kevin Sharkey and Patrick Feeney have already begun canvassing for a nomination. Candidates need the support of four councils or 20 members of the Oireachtas to secure a place on the ballot for the October election. “It’s incumbent on the independents that are elected to the Oireachtas that they facilitate somebody, to give them the opportunity, who wish to run for president through the process of a signature. “Does not mean they have to endorse them or go out and canvass for them but I think the process at the moment is very tough for those expressing an interest,” Fitzmaurice said. Fitzmaurice told Catríona Perry that he had sent an email to all elected independent representatives about a month ago and had gotten 19 responses so far, but they had not specified who they would support. 19 is not enough, that’s being very blunt about it. “I want to move this on to see one way or the other are the independents going to set up the mark or are we going to sit on our hands and leave someone driving around Ireland and not facilitate the process,” he said. 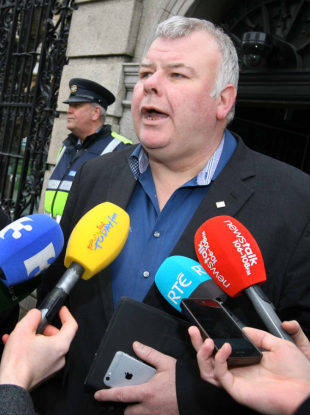 Fitzmaurice said that he hoped to receive more replies by 5 September and that a meeting would be held when the Dáil returns from its summer recess to meet the hopeful candidates. “We should know as independents, it’s a fair struggle to go up against the big guns. Email “Michael Fitzmaurice urges fellow independent TDs to join together to nominate a presidential candidate ”. Feedback on “Michael Fitzmaurice urges fellow independent TDs to join together to nominate a presidential candidate ”.